As I am sure you are aware, in 2005 the city of New Orleans was devastated by Hurricane Katrina. I hope you are also aware that the rebuilding process is still ongoing. There are still an unacceptable number of people who have been unable to return home. Many organizations have been donating time and money to try to assist these displaced families. I am honoured to report that I have been asked to participate in a fund-raising project that will provide money to one of these organizations - Samaritan's Purse. The event is a virtual, on-line Flea Market hosted by designingdna. It will be held on March 20th and 21st. Click the square on the side to learn more, and/or donate to this cause directly. I will be donating 10% of all my sales from those two days in my String Me Along shop. Shop ahead for Mother's Day, wedding season or buy yourself a little springtime treat and help out a good cause while doing so. 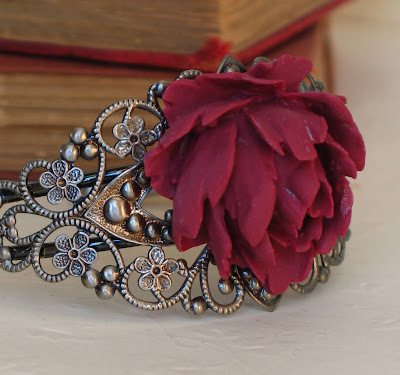 This Burgundian Rose Cuff Bracelet is new in my shop. Many other spring arrivals are also now available.